Yellowstone National Park is one of the most visited national parks in the United States, and rightfully so. The beautiful mountains, pristine rivers, herds of wild buffalo, blazing hot springs and Geysers and so much more make this place a truly one of a kind environment. It can be frustrating, however, to head to Yellowstone in hopes of getting a taste of the natural wilderness only to find that everywhere you go, you are surrounded by thousands of talkative tourists whose radios, picture taking and the like kind of takes the magic out of the moment. While Yellowstone is known for drawing a crowd, there are also some fantastic places you can go to get away from the crowds and experience the essence of the wildness of one of America´s most iconic national parks. Below you´ll find information on five fantastic overnight hikes in Yellowstone National Park. If you are looking for a hike that will take you away from the crowds as quickly as possible, this is the option for you. While it is only a 1.4 mile hike to this backcountry campground, that is more than enough distance to separate you from the majority of tourists who frown upon carrying their bed in a backpack. They call this trail the chain of lakes because the trail follows a number of mountain lakes that form in descending fashion throughout the mountain. Ice Lake is the closest one, and you can choose how far you plan to go. Wolf Lake is about a 4 mile hike making it a bit more secluded than Ice Lake. For experienced backcountry backpackers who like the thrill of trying to blaze their own trail, the Howard Eaton Trail offers a unique challenge. This trail hasn’t been maintained in a number of years. While there are still parts of it where a trail is recognizable, other parts have been lost to vegetation. Trying to find your way along a lost trail offers a healthy dose of adrenaline to anyone. Throw in the fact that this is prime grizzly bear country and you´ll find yourself instantly on your toes during the entirety of the hike. The old Howard Eaton Trail is the best place in the park for people wanting to explore on their own. If you want a little longer hike, the Bighorn Pass backpacking trip will take you close to 9 miles into the wilderness. This hike takes you along the Gallatin River and is one of the best places to find black bears, grizzly bears, and herds of elk. There are a number of backpacker only campsites along the way and you might even be able to find a campsite near a marmot colony. Their friendly chirping will keep you entertained throughout the night. The best place in the whole park to see the Lamar Valley and offers perhaps the best scenic, panoramic views. Furthermore, along the Lamar River you will most likely find bison footprints, and if you know how to recognize, the iconic gray wolf. This area is known as the American Serengeti because of the huge amount of wildlife including bear, elk, antelope, wolves, and much more. To get away from the crowds at Yellowstone, you can´t simply take a tent and sleeping bag and head into the wilderness. All backcountry travelers and campers need a permit to camp outside of the regular campgrounds. You will need to apply at least 48 hours ahead of your planned trip. If you are planning to hike during peak summer season, you might also find that many of the backcountry campsites that you wanted to reserve have already been reserved, so plan accordingly. If you have seen Old Faithful and done some of the more common day hikes at Yellowstone but want to get away from the crowds, the backcountry of Yellowstone offers a glimpse into a whole different side of this classic National Park. Do your planning ahead of time and pick any of these five fantastic backpacking trips to get a taste of the unspoiled wilderness of Yellowstone. Washington State isn’t often considered to be one of the most ecologically diverse states of our country. Nestled into the top northwestern corner of the United States, it often gets passed up on for other supposedly more exotic locations for hiking. The difference between eastern and western Washington are so striking, however, that it might feel like you´ve travelled across the world after a short 5 hour car drive. From the lush Cascade Mountains and the Hoh Rainforests in the western part of the state to the dry, wheat fields and prairies of the eastern part of the state, Washington offers a number of uniquely different ecosystems and environments. A fantastic vacation idea would be to start in the Spokane area of eastern Washington and drive all the way to the Pacific Ocean. Along the way be sure to check out some of these awe-inspiring day hikes. The Blue Mountains in the south-eastern part of Washington aren’t as famous as their western counterparts, but they still have plenty to offer. The ridgeline trail that goes through the Wenaha-Tucannon Wilderness will take you to a beautiful overlook. On a clear day you will be able to see down into the valley of wheat fields and open spaces. There is something undeniably magical about mountain lakes, and the Tolmie Peak Lookout stairs down into the pristine Eunice Lake which shines like a sapphire amidst an emerald green softwood forest. Located near Mount Rainier National Park, this simple day hike will offer you beautiful views of one of the most iconic peaks in the state of Washington while also taking you up to almost 6,000 feet elevation. Mount Saint Helen´s might not be as active as it was a couple of decades ago, but this trail in the South Cascades region offers you a pretty unique experience. You will be able to take in pretty cool views of the old volcano itself while also appreciating the roaming herds of elk. The South Coldwater Trail rambles through treeless valleys which still give testament to the power of destruction that Mount Saint Helens caused. At the same time, the renewed landscape filled with wild flowers speaks to the power and resiliency of the natural world. In the northern part of the Olympic Mountains you can find a unique trail in Sunrise Ridge. This trail which is within Olympic National Park is a wildflower-lover´s delight. If you time it right you will find field upon field of every type of wildflower including lupine, larkspur and everything in between. This is also a great trail to come upon all sorts of wildlife. Really? A rainforest in the United States. While many of us might think that rainforests only exist in Brazil or Indonesia, the United States does have its own swath of untouched, virgin rainforest in the Hoh National Park. Walking through the lush greenness of the Hoh Rainforest Trail is an experience unlike any other. Monstrous trees hung with thick moss and the unending song of hidden birds will make you feel like you´re in another country. The relatively open understory allows you to truly take in the beauty of America´s only rainforest. In the Central Cascades, Larch Lake trail offers one of the most secluded places you can get to in a day. This hike isn´t easy as you´ll gain over 2,500 feet of elevation in 12 round trip miles, but if you make it to the lake you´ll be greeted by one of the Cascades best kept secrets. Hiking this trail in early fall is by far the best time as the azure glow of Larch Lake will contrast beautifully with the golden leaves of fall time. If you are in the Cascades Region, you will also want to check out Spider Meadow. A 13 mile round trip hike will take you through meadows and alpine highlands while giving you glimpse into the unique ecosystem of Glacier Peak Wilderness area. Chances are that during your cross-state excursion throughout the state of Washington you´ll also come across dozens of other beautiful areas beckoning for you to stop and explore. You might not even be able to drive more than a couple miles without feeling the itch to see what´s over the hill. Exploring Washington State through these day hikes will offer you a glimpse into the natural beauty this state has to offer. Let´s face it: not everyone is built for enduring the elements during a five day, strenuous backpacking trip up some 14,000 foot mountain. That´s what makes the Smoky Mountains in Tennessee so great. Even a few steps off the road and you´ll feel like you´re enveloped in a beautiful, pristine wilderness. Clingmans Dome is the highest point in the park at 6,643 feet. You can take the leisurely drive through the forest to the top of the dome where you will be greeted by outstanding panoramic views of the hazy, surrounding mountains. There is simply no better place to catch a sunset here in the park. If you are not in the best shape or don´t enjoy hiking up steep mountains, the Laurel Falls Trail offers a nice stroll through the woods. The 2.6 mile loop trail is mostly flat with a few small hills. But don´t let the ease of the hike fool you into thinking you won´t get to see much. The culmination of the hike is a view of a gorgeous 80 foot high waterfall splashing into a small pool at its base. If you plan it at the right time of the year, you can also enjoy the flowering rhododendrons. This is a great hike to do with young children as it will open up to them the wonders of the natural world without not being too strenuous for their young legs. While the Laurel Falls are pretty accessible to anyone, the Ramsey Cascades Trail is a pretty strenuous trail. This 8-mile hike increases close to 2,000 feet in elevation which means that you probably won´t run in too many other people. The trail takes you through beautiful forest and follows the gushing waters of a stream. If you make it to the end of the trail, you´ll be greeted to the park´s tallest waterfall with over 100 feet of fall. In the small pool at the bottom of the fall you should be able to find uniquely colored salamanders. One of the most unique places in the park to see the autumn foliage is Campbell Overlook. It is the best place in the park to see towering Mount LeConte and other forests. You can get there by car, or, if you prefer, through numerous hiking trails. The Alum Cave Bluff Trail will take you up to the top of Mount LeConte, the most iconic peak in the Smoky Mountains National Park. While there are several different trails to help you get up Mount LeConte, this trail is the steepest, less-frequented, and offers several unique sights along its way. From a spot called Inspiration Point you can hike through an arch and get a view of the “Eye of the Needle” a hole in a rock in a nearby ridge. The Applachian Trail goes from Georgia all the way to Maine. If you´re not up for spending 6 months crossing the entire country by foot, you should at least hike a part of the trail that crosses through the Smoky Mountains. Standing Indian Mountain is our pick for the best place to get on the AT and can easily be done as a simple overnight backpacking trip. If hiking isn’t your thing, the Roaring Fork Motor Nature Trail takes you into the heart of the Smokies. You will pass by old homesteads and also have the option to walk to the Rainbow and Grotto Waterfalls, both of which should not be passed on. There are hundreds of things to see in the Smoky Mountains, but one thing that you absolutely can´t miss is Cades Cove. This beautiful rolling meadow offers a loop tour that you can hike, drive or bike and offers a glimpse into centuries past. Cades Cove used to be an agrarian settlement and you can still see beautiful constructions of old log cabins hidden in the thick woods. It´s also a great spot to catch a glimpse of a black bear, if you´re lucky. Like most places in the park, the best time of year to visit is in the fall time to enjoy the beautiful colors on the trees. Any of these travel ideas throughout the Smoky Mountains will offer you a truly unique experience. From backwoods hiking to comfortable and accessible wilderness, the Smokies offer a little bit of everything for families, independent adventure seekers, and everyone in between. South Africa has a lot of amazing national parks and places to visit. Although we try our best, its difficult to cover every single detail about these parks. In fact, you can likely write books about many of these places. It is far from complete and the guide is still growing. If you feel we left something out, feel free to reach out and suggest changes or contribute. Located 72 kilometers from Port Elizabeth in the Eastern Cape Province, The Addo Elephant National Park is the third largest park in South Africa. The Addo region surrounds the Sundays River, which has its entrance at the mouth of the Indian Ocean. The park was established in 1931 to protect 11 Elephants on the brink of extinction. Today, the thick bushveld is the sanctuary of hundreds of elephants, as well as Cape buffalos, endangered black rhinos, Transvaal lions, spotted hyenas, a variety of antelope species, hundreds of bird species and the endangered flightless dung beetle. Mile after mile of the Sundays River Valley is vegetated with evergreen citrus trees that bear fruit all winter and fragrance the air with their blossoms in spring. Interesting fauna and flora can also be found in the Zuurberg Mountains, which falls within the park, such as three rare cycad and two yellowwood species. The largest remaining population of the flightless dung beetle (Circellium bacchus) is located within the park. Visitors can choose between guided game drives, hop-on guides and self-drive game viewing. Two-hour guided game drives take place in the morning, afternoon and night, as well as at sunrise and sunset. Visitors are also allowed to view wildlife from their own vehicles and local hop-on guides are available to accompany them. Visitors have the choice of two horse trails: the Addo Horse Trails (where large game can be viewed from horseback) and the Zuurberg Horse Trails (which does not provide encounters with wildlife but instead offers beautiful scenic views from the mountains. The Bedrogfontein 4x4 trail provides breathtaking views and is rich in history. This route was the scene of fierce battles between the Afrikaner and British and Afrikaner troops during the Anglo-Boer war. Rock art paintings can be viewed throughout the area. From the route a variety of the South African vegetation types can be observed, including riverine thicket, afromontane forest, fynbos and arid nama-karoo. The park offers numerous hiking trails. The Alexandria Hiking Trail is a 32 kilometer, two-day circular trail – with the first day covering a distance of 18.5 kilometers and the second day a distance of 13.5 kilometers. Shorter hiking trails are also available. One-hour and three-hour trails can be hiked in the Zuurberg Mountains, while the PPC Discovery Trail is a short walk in the main camp. Visitors interested in seeing a great white shark and/or southern right whale might want to partake in a Marine Eco-tour. Day visitors can enjoy something to eat in the picnic area. Situated at the southernmost tip of Africa in the Western Cape Province of South Africa, the Agulhas National Park stretches for 45 kilometers along the coastline, from east to west, and extends up to 25 kilometers inland. The cold Benguela current, of the South Atlantic Ocean, and warm Agulhas current, of the southwest Indian Ocean, meet at the edge of the Agulhas Bank. Portuguese explorer Bartolomeu Dias was the first to discover the southernmost tip of Africa on 16 May 1488. In 1999 the Agulhas National Park was declared as a formal protected area not only because of its geographical location, but also to protect the lowland Fynbos, the unique wetland systems, the rich cultural heritage aspects and the diverse marine life of the area. Cape Agulhas Coast is known as the Graveyard of Ships because numerous shipwrecks of early explorers – attempting to conquer the wild seas off the southern tip of Africa – dot the coastline. The navigators of the 1400’s to the 1700’s, who discovered the sea route around the southernmost tip, observed the sun at noon when it passed the meridian and found that the magnetic compass pointed to true north. Today it points some 25 degrees west of true north. In the 1700s the Europeans settled as stock farmers in the area and pioneered the merino wool farming industry in South Africa. Agulhas National Park offers two hiking trails. The circular Two Oceans Hiking Trail covers a total distance of 10.5 kilometers, which takes four to five hours to complete. However, two alternative routes with shorter distances are offered on the trail. The circular Rasperpunt Hiking Trail covers a distance of 5.45 kilometers and takes three hours to complete. In the heart of the Lowveld, nestled between South Africa’s northeastern provinces Limpopo and Mpumalanga and bordering Zimbabwe and Mozambique, the iconic Kruger National Park is the largest national park in South Africa and one of the largest national parks in the world. The park is approximately 352 kilometers long and has an average width of 60 kilometers. The park was first proclaimed in 1898 as the Sabie Game Reserve by the then president of the Transvaal Republic, Paul Kruger, and later expanded into the Kruger National Park in 1926. The park was initially created to regulate hunting and protect the diminished number of animals in the park. In 1927 the first three tourist cars entered the park. Today, hundreds of thousands of local and international tourists enter through the park’s nine gates each year – hoping to catch a glimpse of Africa’s Big Five (the African lion, African elephant, Cape buffalo, African leopard and rhinoceros). Income from tourism and trading activities generates more than R200-million per year, and the Kruger Park plays a major role in the Lowveld's economy. Visitors eager to spot the Big Five can make use of the "Park and Ride Scheme." The Kruger National Park offers several trails through its wilderness areas and has numerous rest camps. The duration of all the wilderness trails is two days and three nights. Longer backpacking trails, lasting four days and three nights, are also available. The park’s guests can take advantage of early morning and afternoon guided walks, where two armed field guides accompany a small group of guests to share their knowledge of the fauna and flora to explain natural wonders. Morning-, sunset and night drives are available. The park offers several self-drive 4x4 routes ranging in distance from 48 kilometers to 500 kilometers. A guided one-night, motorized adventure trail is also available. Mountain bikes are supplied to visitors, who can then cycle the unspoiled bush along with two armed field guides. Surrounded by the rich wildlife sanctuary, the Skukuza Golf Course sits unfenced within the park – allowing for uninvited spectators to make their appearance during a round of Golf. The park has an abundance of avifauna viewing opportunities. Some of the bird species in the park cannot be found anywhere else in South Africa. A game drive takes visitors to an open area filled with burning lanterns and fires where, whilst listening to the sounds of the bushveld and the distant animals calling, the food is grilled on open fires. There is definitely no shortage of fun-filled activities at Kruger National Park. However, as with any visit to a new place, you need to do your research to make sure you make the most out of your time here. While you certainly can bring suitcases full of stuff to visit Kruger, one of the best ways to get in tune with the natural world is through coming with the bare minimum. By only bringing the bare minimum, you will have more of a chance to directly experience the wonders of the natural world all around you. Ultralight backpacking is a growing trend in the backpacking world and is perhaps the best way to enjoy Kruger National Park. Check out our complete guide to help you choose the absolute best ultralight backpack. Located at the foothills of the Maluti Mountains in the Free State Province of South Africa, near the Lesotho border, Golden Gate Highlands National Park was officially proclaimed on the 13 September 1963. The park is more renowned for the beauty of its landscape, which offers panoramic views, than for its wildlife. The grassland biome of the park is pierced by multi-hued, eroded sandstone cliffs and outcrops. Golden Gate derives its name from the color of the setting sun on the west facing sandstone cliffs, especially the picturesque Brandwag Buttress cliff. The park also features the spectacular Cathedral Cave – a 250 meter long and 50 meter deep cavern carved into the sandstone over millions of years by water, wind and fluctuations in temperature. During the 1800s the plains around Golden Gate was swarming with game – most of which were migratory in nature. Today, the highland habitat is the refuge of a variety of mammals (mostly antelope species), birds, snakes and fishes. The rare bearded vulture (lammergeier) and the equally rare bald ibis can be found in the park. The Museum Tour displays a depiction of the architecture and life style of the Basotho people from as early as the 16th century to the present day. The Golden Gate Highlands Hotel offers a tennis court, volleyball and mini soccer ball. Situated west of the southern African subcontinent in the Kalahari Desert, the second largest desert in Africa, lies the Kgalagadi Transfrontier Park. The park straddles the border between South Africa and Botswana, and borders Namibia to the west. Approximately three-quarters of the park lie in Botswana, called the Gemsbok National Park, and one-quarter lies in South Africa, called the Kalahari Gemsbok National Park. The Park was proclaimed in 1931 to protect migrating animals from poaching. Kgalagadi means "land of the thirst." The park is characterized by red dunes, camel thorn trees and dry riverbeds. Two predominantly dry rivers run through the park – the Nossob and Auob Rivers, which are said to flow only once per century. Kgalagadi Transfrontier Park is especially renowned for watching predatory animals. Mammals, like Namibian cheetahs, leopards, brown- and spotted hyenas and the black-maned Kalahari lions, as well as birds of prey, like raptors, vultures, buzzards and secretary birds, are popular attractions. Seasonal migrating animals, such as blue wildebeest, springbok, eland and red hartebeest, can also be found in the park. There are an estimated 450 lions, 150 leopards, 200 cheetahs, 600 brown hyenas and 375 spotted hyenas in the park. Namaqua National Park is situated in the western part of the Northern Cape Province of South Africa, just south of the Namibian border. The park is part of the Namaqualand region, which falls within the semi-desert Succulent Karoo biome – a biodiversity hotspot with the largest concentration of succulent plants in the world. The Namaqua National Park was proclaimed on 29 June 2002 for the purpose of conserving the rich diversity of succulent plants. However, people have long since been visiting the area to admire its renowned “carpets” of colorful wildflowers. The landscape, with its breathtaking beauty and contrasting colors, is also a photographer’s paradise. After the winter rains, tourism peaks during springtime (August and September) when a burst of spring wildflowers appear. Most of the wildflower species are protected under law and visitors who decide to pick themselves a bouquet will face fines. Seventeen percent of Namaqualand’s plant species are listed as Red Data species. The Caracal Eco Route stretches from the mountains to the coastline to allow visitors to experience a wide range of Namaqua habitats. The distance of the route range from 176 kilometers to 200 kilometers, depending on which tracks are selected. Even though there are no formal mountain biking trails in the park, there are a wide range of roads and terrains which visitors can cycle. The park has two hiking trails (5 kilometers and 3 kilometers) from which visitors can view flowers, as well as a longer hiking trail (6 kilometers) along the coastline. Species to search for include Cinnamon-breasted Warbler, Cape Long-billed Lark, Karoo Lark, Black-headed Canary and Cape Bulbul. Picnic sites are available throughout the park. Make sure you bring a cooler to keep all your food fresh and your drinks cool. Take a look at this article to find all the best camping coolers available today. There are few places anywhere on the African continent where you can find such diverse beauty as at the Garden Route National Park. This massive national park has over 150,000 hectares and includes diverse ecosystems from coastal areas where you´ll be able to explore sea caves containing evidence of prehistoric civilizations and watch killer whales swim close to the shore to strings of crystal mountain lakes. Garden Route National Park is perhaps one of the most diverse areas to explore in South Africa and offers several different ways to explore the park. From weeklong backpacking adventures to canoeing and kayaking, to 4x4 vehicle tours throughout the park, there are several different ways to discover this truly unique and one of a kind place. · The Indian Ocean borders the park to the south while the Tsitsikamma, Langkloof and eastern Outentiqua Mountain ranges form other boundaries of the park to the north. · The area of Garden Route National Park has been occupied by human inhabitants for over 125,000 years. · Near Klasies Rivers, a number of sea caves containing archaeological artefacts such as stone tools and human skeletons have been found and explored. · The indigenous San People arrived in the area over 20,000 years ago. · The area first gained protection in 1964 with the proclamation of the Tsitsikamma National Park. · In the deep evergreen forests of the park you can find Outeniqua yellowwoods which are massive trees that are easily 800 years old or older. · Vervet monkeys and even leopards are some of the wildlife you can find in the mountainous regions of the park. · On the coast it isn´t uncommon to spot bottlenose dolphins, otters, and even killer whales. · While there is plenty of nature to explore throughout the Garden Route National Park, there are also plenty of beautiful towns with art galleries, golf courses, and craft breweries to help you recover from time well spent in the wilderness. One of the best parts of the Garden Route National Park is that no two people ever experience it exactly the same. The diversity of recreational options along with the diverse ecosystems that make up the park mean that you can literally spend a lifetime exploring all that this park has to offer. While some people may choose to lounge on the beautiful beaches of the warm Indian Oceans, other may hike through rugged evergreen forests trying to spot some of the most iconic wildlife in the park. Still others might seek out the Bohemian nightlife of the beautiful towns while others will head to the rocky cliffs to try and spot humpback whales and other sea creatures. With so much to do at Garden Route National Park, it is hard to focus our attention on a few activities. Nonetheless, below we offer a few ideas of the best ways to enjoy this truly miraculous national park. While there are several different 4x4 roads that will allow you to explore the vast areas of the park, the best way to enjoy the natural wonders of this beautiful area is through allowing your own two feet to carry you through some of the hundreds of miles of trails that criss cross the park. For true adventure seekers, the Slackpacker Trail is 63 km of pure wonder that will allow you to experience the several different ecosystems the park has to offer. From beautiful sandy beaches to coastal thickets and dune forests, this several day adventure will let you experience several aspects of the Garden Route. You will also get to canoe down the Touws River for a couple hours during one stretch of the trail, refreshing yourself in the cascades and quality swimming holes. For people who want to hike Garden Route National Park but don´t feel up to the challenge to take on 63 km, the Dune Mole Rat Trail is a 6 kilometer trail that weaves through wetlands where you´ll be able to catch sight of hundreds of different bird species. For avid birdwatchers, this is a trail that you don´t want to miss. Finally, another hiking trail we´d recommend is the Elephant Walk where you´ll be guided through elephant trails that meander throughout the Diepvalle Forest. If you´re lucky, you might even find one of the forest elephants in their natural habitat. After hiking through the thick forests and beautiful beaches of the Garden Route, another way to explore this unique area is by getting a bird´s eye view. There are several different tour operators that offer aerial tours of the park, both by airplane, helicopter, and hot air balloon. With small airports located throughout the region, you can even plan out your own trip and stop down at one or several areas throughout the park. If you are looking for a truly unforgettable experience, consider signing up for a hot air balloon ride early in the morning as you will be able to watch the sun rise over the Indian Ocean as the mountains and forests to the west light up with the morning colors. The history of the Garden Route National Park goes back hundreds of thousands of years and is one of the places throughout Africa to dive into the rich and varied history of the area. While you can find several small museums throughout the park and its surroundings, one of the best ways to learn about the history is through taking a guided 5 day hike along the Hunter Gatherer Trail. Another great way to explore this beautiful national park is by bike. There are hundreds of miles of dirt roads that you can explore without having to worry about too much traffic outside the occasional jeep tour that you might encounter. One of the best bike trails worth exploring is the Harkerville Red Route. This roughly 22 km trail will take you along the Harkerville coastline offering breathtaking views of the rocky coast below. While the trail is rather strenuous, you will also enjoy biking through some old growth, indigenous forest before emerging from the woods with views of the Indian Ocean. Who wouldn´t enjoy flying through the tree line that you share with monkeys and other forest life? The Tsitsikamma Canopy Tour is an absolutely fantastic way to explore the forest canopy where you are likely to encounter tucacos, monkeys, and all other types of birds and wildlife that live up off the forest floor. While this is definitely an adrenaline type experience, you will also learn plenty about the beauties of South Africa´s indigenous forests. Situated in the city of Cape Town in the Western Cape Province of South Africa, Table Mountain National Park is a uniquely urban nature reserve – fragmented by urban development and privately owned land. Beaches, bays, valleys, forests the Cape of Good Hope and the famous Table Mountain are all incorporated into the park. Table Mountain National Park was proclaimed on 29 May 1998 to protect the natural environment of the Table Mountain Chain. In 2011, Table Mountain was declared as one of the world's new seven wonders of nature. The mountain and acclaimed landmark offers spectacular views of Cape Town as well as unique flora. Table Mountain National Park is part of the Cape Floristic Region World Heritage Site. The other two sections of the park are the Silvermine-Tokai section and the Cape Point section. The Silvermine-Tokai section was formed from the Tokai State Forest and the Silvermine Nature Reserve. The Cape Point section covers the most southern area of the Cape Peninsula and includes Cape Point and Cape of Good Hope. The park includes 25,000 hectares of the Cape Peninsula Protected Natural Environment, as well as 1,000 km² of the seas and coastline around the peninsula. Because the park has open access, it is the most visited of all National Parks – with 4.2 million visitors annually. The park has 8,200 plant species – of which around 80% are fynbos. Many of the plants found in the park are endemic. The Cape Floral Kingdom is the only kingdom confined to one continent. Table Mountain National Park is included as part of the UNESCO Cape Floral Region World Heritage Site. The main feature of Table Mountain is the level plateau, which is approximately 3 kilometers from side to side. The highest point on Table Mountain is towards the eastern end of the plateau and is 1,086 meters above sea level. Table Mountain National Park and Cape Town have a Mediterranean climate – characterized by typically hot, dry summers and short, wet, yet mild winters. The top tourist destination is rich in cultural and natural heritage. Wildlife, including eland, red hartebeest, bontebok and zebra, are found in the area. Visitors can visit the two lighthouses situated at the most southwestern point in Africa. Cape of Good Hope also offers hiking, surfing, angling, picnicking, beaching and cycling opportunities. Free guided walks are also available at Cape Point. The Cape of Good Hope Hiking Trail is an overnight hiking trail. A colony of endangered, land-based African penguins can be viewed at the Boulders section of the park, which is situated in Simons Town. There are also three beaches and three boardwalks in the area. The mountain offers a variety of hiking trails – ranging from light strolls to rigorous hikes. The summit of the mountain provides spectacular views of the city, while the ascent takes visitors through the ancient, indigenous Afromontane forest. A shortcut to the top of Table Mountain is also available via the Table Mountain Arial Cableway. Lion's Head is the peak to the right of Table Mountain when facing it head on and offers a short but popular hike with 360 degree views of the Atlantic seaboard, the city and Table Mountain. It has become popular to hike Lion’s Head in groups during full moon. Signal Hill, the Northern-most tip of the terrestrial area of the park, is a popular viewpoint which offers excellent views of the city and harbor. It is from here that the noon day gun marks 12:00 in Cape Town. Silvermine offers some of the best hiking trails in the park, which passes by fynbos landscapes, a dam, a river and a waterfall. Bird spotting, picnics, dog walking and mountain biking are also favorite activities in the area. Table Mountain National Park has a variety of diverse beaches on offer. The Table Mountain National Park Marine Protected Area is a popular fishing area for shore and boat-based fisher people as well as extractive divers. The Table Mountain National Park Marine Protected Area is a scuba diving haven. What makes the area popular among divers is the numerous wrecks that scatter the coastline as well as the six restricted areas ("no take" zones) that have been established as breeding and nursery areas for marine species. Popular dive sites include the Maori wreck off the Sentinel in Hout Bay, Oudekraal on the Atlantic Seaboard and Miller's Point and Smitswinkel in False Bay. A plethora of rocky points, reefs, beaches and open ocean Atlantic swell provide numerous breaks that work in different conditions. Table Mountain, with its rocky ledges and huge boulders, attract climbers from all over the world. The park has numerous picnic and braai (to grill on open flames) areas. There are numerous designated launch areas in the park, including Lion's Head and Silvermine. Popular horse riding areas include Tokai, Noordhoek Beach and Black Hill. Apart from Table Mountain’s Afromontane Forest, the park also includes Newlands Forest, Orange Kloof in Hout Bay and Echo Valley and Spes Bona on the Muizenberg mountains. Imagine visiting a national park where over 95% of the close to 750,000 acres were designated as pure wilderness. Now imagine the fact that the vast majority of the four million people each year who visit only spend their time in the seven square miles that make up Yosemite Valley. Despite being one of the most beautiful national parks in the United States, much of Yosemite still remains an unexplored wilderness. Yosemite National Park is filled with breathtaking mountain ranges, waterfalls, mountain lakes, glaciers, and towering redwood forests. There is truly something for everyone in this impressively picturesque World Heritage Site, and we´ll take you through seven of the most amazing things to see in Yosemite. Yosemite Falls is one of the highest waterfalls in the United States dropping close to 2,500 feet from the top fall to the lower fall. For the more adventurous of people, you can take a strenuous several mile hike up to the top of waterfall enjoying gorgeous views along the way. Spring is by far the best time to visit when the snow melt and extra rains bring the waterfall to a crashing roar. If you do hike to the top, you can even wade in the river only feet from where it eventually crashes over 1,000 feet downwards to the second fall. Half Dome is another daunting adventure for backpackers and hikers alike. The granite dome that juts up into the sky is rounded on three sides but a sheer granite face on one side, thus giving it its name. An incredibly strenuous 8.5 mile hike will take you to the top of Half Dome via hundreds of stairs carved into the granite rock. Alternatively, for the truly adventurous, you can choose to mountain climb the sheer granite face on Half Dome´s northwest face. California used to offer the promise of striking it rich during the hay days of the California Gold Rush. Today you can still find a number of rivers where gold can be found if you bring the right patience and skills. 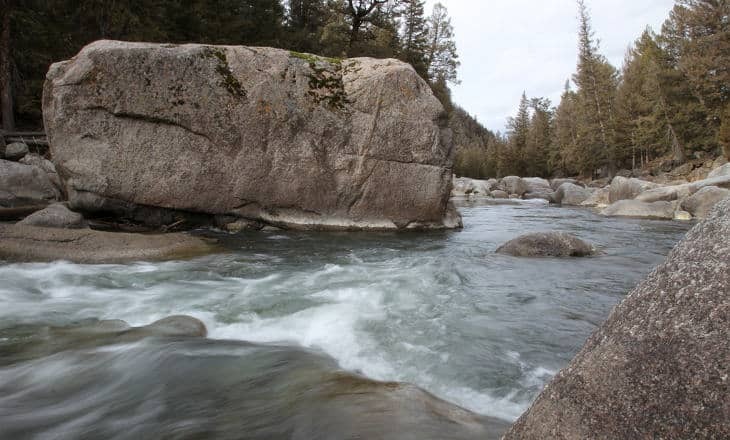 The Main Fork of the Merced River is one of the best places in the park to search for gold. You will need to bring your own panning equipment, though there are several nearby stores that will sell you what you needed to try and strike it rich. For adrenaline junkies, what could be better than trying to climb up a 7,500-foot granite monolith that offers more than 3,000 feet of free fall to the valley floor below? El Capitan is a massive rock formation located in the northern part of Yosemite Valley. Even experienced mountain climbers often need a minimum of five days to complete the climb, so make sure you plan accordingly. For people who aren’t up for climbing up steep mountain faces, Yosemite still offers access to beautiful, breathtaking panoramic views. The Tioga Pass is a mountain pass through the Sierra Nevada mountains that approaches 10,000 feet. Route 120 drives right through the pass and is the eastern entrance way into the park. Leave early in the day to get the best views. The Tuolumne Grove of Giant Sequoias will help you put your size in perspective. During a leisurely walk through the old growth forest you can even walk through a massive tunnel carved out of a dead sequoia. For a more secluded experience the Mariposa Grove of Sequoias is just up the road. One of the best places to watch a sunset in Yosemite National Park is at Olmsted Point which is an overlook off of the Tioga Road that offers a wonderful view into the canyon with views of Half Dome and other lakes. Olmsted Point offers some of the best views of the park for those who aren’t willing or able to scale mountain faces. Yosemite National Park is without a doubt one of the most beautiful national areas of the United States. Whether you are looking for the adrenaline of free climbing El Capitan or want to drive to Tioga Pass to enjoy the views, Yosemite has adventures waiting for everyone. Check out this next guide about camping places in Yosemite: What are the Best Places to Camp in Yosemite? Thinking about taking a road or Van Trip to Yosemite? Check out this article to learn how to pack your Van! With an extreme elevation of 2,000 to more than 13,000 feet, Yosemite provides diverse habitat for over hundreds of species of birds. Below are some of the birds that can be found in Yosemite National Park. Also known as mountain blue birds, Stellar’s Jays are one of the common birds at Yosemite. What’s interesting, though, is that these so-called “blue birds” are not blue at all. Their feathers do not have blue pigment in them. Their feathers are made of keratin which when hit by sunlight causes blue wavelengths to reflect back, giving these birds its radiant color. Juncos are little sparrows that have small rounded heads. You’ll most likely catch a glimpse of these birds as they hop around bases of trees looking for fallen seeds. These magnificent birds are known to be the largest owls in North America. Although Yosemite is home to 65% of owls’ population in America, these birds are not easily spotted. They prefer to hunt in mid-to-upper elevated woods where most visitors don’t like to spend much time in. Historically known as the duck hawks, peregrine falcons are known for its incredible speed of up to 320km/h, making it one of the fastest members of the animal kingdom. These birds were once endangered species, but due to the diligence of the park to protect them, peregrines’ recovery has been made possible. Among the birds of Yosemite is Sooty Grouse, a bird the size of a chicken. You may spot these birds or hear the males’ calls – a loud booming sound that can be heard for miles – as they attract the females. These reddish, or Tyrian purple birds are migratory birds that can be seen in Yosemite. A trip to the park in summer gives visitors more chance to spot these beautiful birds, as these birds spend a lot of time on the ground of Yosemite Valley during this season. You’ll recognize a hermit thrush through its feathers, with rich brown upper body and smudged spots on its breast. As you walk around the park, take time to listen to its call, a soft chuck or sup. Visitors have been fortunate to spot a hermit thrush most often at dusk or sometimes mid-day, as it hops around and scrape in leaf litter while foraging. These birds are called acorn woodpeckers for they depend heavily on acorns for food. Expect to see them among oak trees as they perform their own peculiar method of storing acorns. They store their food in holes they drilled themselves, or sometimes even in natural holes and cracks in barks. A northern goshawk is a medium-sized raptor that is usually found between 5,000 to 9,000 feet in elevation. A lot of hikers in Yosemite have had the experience of spotting a goshawk as it soars high in the air. These little songbirds are a common bird of Northern America. They are known to be slow but persistent singers, often times their songs can be heard in Yosemite Valley. Also known as the Arctic three-toed woodpecker, these birds are known for the color of their feathers. Their feathers are white from the throat to the belly, and black on its head and back. Most of their food are acquired through pecking, and sometimes by gleaning off branches as well. Grosbeaks are seed-eating birds with large beaks. There are a lot of grosbeak species, and the one that can be found in Yosemite is the black-headed grosbeak. This particular bird is a frequent summer visitor of the park, and is common in Yosemite Valley. Usually seen during the winter season, American dippers are birds that like to frequent near cascades and dashing waters of upper Yosemite. During winter, more dippers come to Yosemite when the rivers and valley falls are stilled. You may recognize them by their distinct behavior of squatting their bodies up and down, hence the name dipper. A mountain chickadee is one of the common birds you may spot in Yosemite National park. Their feathers are gray, and there is a distinctive white line above each of their eyes. Chickadee’s diet consists mainly of different kinds of insects and spiders. They also come to birdfeeders for food, and are busy storing nuts and seeds for later use. Birdwatching in Yosemite is surely a unique experience. While spending time in the park, look around and listen carefully to the harmonious calls and songs of countless birds. However, every birdwatcher should keep in mind basic birding etiquette. While enjoying and exploring these birds, remember that following the park’s rules is the most important. Make sure you always go by the rules, as these rules are implemented to protect and nurture these beautiful creatures. Yosemite National Park is a national treasure located within California’s beautiful Sierra Nevada Mountains. Whether it’s the ancient, tall Sequoia trees or the granite cliffs of El Capitan and Half Dome, Yosemite offers a little bit of everything for the adventurous traveler who wants to explore a special part of the American West. The most important thing to keep in mind is when during the calendar year is the best time to visit Yosemite National Park? The answer to that question really depends on your own personal preference but there are both advantages and disadvantages to going during different months to Yosemite. Most travelers to Yosemite National Park would consider the spring season to be the best time in which to visit due to the moderate climate and the fact that it’s not the high season for tourism yet. When it comes to the month of March, it’s important to be aware that certain parts of the national park are going to be closed or unavailable. Tioga Road and Glacier Point Road are usually not accessible to the public during these months due to some winter snow that could be continuing. This means that Tuolumne Meadows and Glacier Point, two of the highlights of Yosemite, won’t be available to be visited starting at the beginning of March. In April, while daytime temperatures are perfect during this month, it can still get chilly at night so make sure to bring a light jacket or sweater with you. In May, everything in the national park is usually open, and the waterfalls during this month have their most volume and flow. Wildflowers and other forms of nature are blooming and it’s not as crowded as other times of the year. It’s hot, hot, hot during this season for those visitors to Yosemite who are willing to bear the humidity, the long lines, increasingly crowded parts of the park. However, during the summer, the beauty and the scenery at Yosemite is at its’ peak and all parts of the park are open to visitors with no weather restrictions. However, if you plan to go on the weekend, be prepared for traffic jams and vacationing tourists crowding your space. You won’t have to worry about rain or snow, as Yosemite is mostly sunny during June, July, and August. If you’re looking to go to the waterfalls in June, you may be disappointed as the volume and flow of water decreases rapidly starting in this month. In July, daytime temperatures can reach peaks into high 90s – low 100s (Fahrenheit) so make sure you bring enough water to keep you and your family hydrated during the day. While Yosemite Valley may be overly crowded especially during the month of August, to beat the crowds, you should check out Tuolumne Meadows during these months due to the lack of crowds, higher elevation, and beautiful views. In the High Sierra Mountains, there are many cool hiking trails to check out and explore. A great time to see the changing colors of the leaves in your town or city is also a perfect season to drop everything and visit Yosemite National Park. Similarly to the spring, you won’t have to worry about large crowds spoiling your plans to visit every nook and crevice in Yosemite during the fall season. Temperatures during the day are also not as hot or humid so you won’t need to carry so much water to hydrate. Because of the agreeable climate, September is considered to be the best month to go hiking or rock climbing in the park with the stable weather conditions. If you decide to hike higher than Yosemite Valley, Tuolumne Meadows is beautiful to visit as well during this time with cooler temperatures than the valley so remember to bring a jacket with you especially for the nighttime. Unfortunately, in October, services on Tioga Road shut down for the rest of the Fall and all of Winter so that may be a drawback if you plan on visiting during this season. The first snow to appear at Yosemite usually appears during October or November so be prepared for that possibility. The waterfalls also stop flowing so heavily and begin to trickle less and less during both October and November. In the month of November, the fall foliage goes into full effect causing the leaves on the oak trees, maples, and dogwoods to show a variety of beautiful and awe-inspiring colors. If you’re looking to go to Yosemite in the wintertime, then you are truly a brave traveler. While the winter season isn’t for everybody, there are still a number of advantages to visiting Yosemite during those months. The crowds are almost next to nothing during this time of year and it is very inexpensive to find accommodations there if you’re staying for a couple of days. There are a number of winter activities to take part in starting in December such as figure skating, and snowshoeing. You can also head over to the Badger Pass ski area where you can take part in snowboarding, cross-country skiing and downhill skiing. Unfortunately, starting in January, road access is completely restricted to popular parts of Yellowstone such as Tioga, Glacier Point, and Mariposa Grove due to the snowy and icy conditions. You can’t really explore the whole park during the month of February but you can still have a good time in places like Yosemite Valley, Wawona, Hetch Hetchy, etc. Temperatures can reach below freezing during February so it’s important to make sure that you and your family bundle up to stay warm. One of the best things about Yosemite National Park is that it stays open to the public year-round from the beginning of winter to the end of the fall. The park offers a little bit of everything to the average visitor is a wonder to behold. For more information about the best times of the year to visit Yellowstone, you should check out https://www.smartertravel.com/2008/06/26/yosemites-best-and-worst-in-every-season/ and https://www.tripadvisor.com/Travel-g61000-c167892/Yosemite-National-Park:California:Best.Time.Of.Year.To.Visit.Yosemite.html. Want to know the Seven Amazing Things to See in Yosemite﻿? Make sure to check out our guide! We orginally posted this on our Yosemite guide, however we felt it was fairly incomplete. To be honest and frank, we didn’t take the time to list the many places to stay and felt the “places to stay” would be better suited to this page. If you would like your hotel or “place to stay” to be added to the list below, we simply ask you help make our guide about Yosemite better in some, way shape or form. Simply contact us if that interests you. Where can you find a lot of places to stay? I would suggest checking out vacasa.com – They list quite a few vacation rentals and is an excellent place to find good deals. If you are having trouble finding a hotel, I’d suggest giving them a try.